God, Charlton and Punk Rock: The wait is over. Even though we've had a superb international football tournament to enjoy this summer, i say summer..., it seems an age since our celebrations of early May. How we've all missed our passion that is domestic football. Charlton along with a host of other clubs enjoyed their first run out since they returned to training today. It's an opportunity for spectators to see the new kit for the first time, watch trialists they have no idea the name of, get a glimpse of and make assessments of the new signings and most of all, watch their club play under no pressure. This isn't just a friendly warm up for the players. Supporters need to get match fit too, it's a long season ahead for all of us. Welling United once again hosted the Addicks for this traditional curtain raiser, although at times many jokingly speculated if the game could be called off due to a waterlogged pitch. Chris Powell fielded a different eleven each half including a trialist keeper named Jacobo who has certainly got people tweeting. After an even first forty five minutes, Charlton showed their dominance in the second to run out 4-0 winners. Goals from Michael Smith, Johnnie Jackson from the spot and Danny Haynes secured the win after an own goal opened the visitors account. Charlton won't begrudge another side taking all of today's headlines though. Maidstone United returned home after a 24 year absence. As Charlton fans (and Maidstone's visitors Brighton) will know, the day you return home to your own ground is a day that will live clear in your mind for years and years to come. I went to the old Athletic Ground with Sutton United back in the late 80's for a GM Vauxhall Conference game. I believe it was New Years Day but i could be mistaken, it was possibly Boxing Day. Mark Golley was the talk of the terraces as the former Sutton hero was helping Maidstone to the title and a life in the football league. At that time you could never have envisaged what would unfold over the next few years. The ground didn't meet Football League standards so Maidstone went off to Dartford to share their Watling Street stadium. They started well in the big time making the play offs but the following season the form dipped as did the attendances. Charlton legend Keith Peacock was at the helm during this period, the poor results on the pitch cost him his job. His successor, Graham Carr didn't last long either! With the club in a dire financial situation bankruptcy was inevitable and Maidstone were expelled from the Football League. Admittedly there are different circumstances involved (most notably Sky's TV revenue), but Rangers take note. The new Maidstone, named Maidstone Invicta initially, dropped seven tiers to the Kent County League fourth division playing youth football! Games were played at the training ground at this level but to move up the ladder, and to play at a senior status, a new home had to be found. Sittingbourne's Bourne Park became the next stop for Kent's nomadic football team as the Stones entered the Kent League. 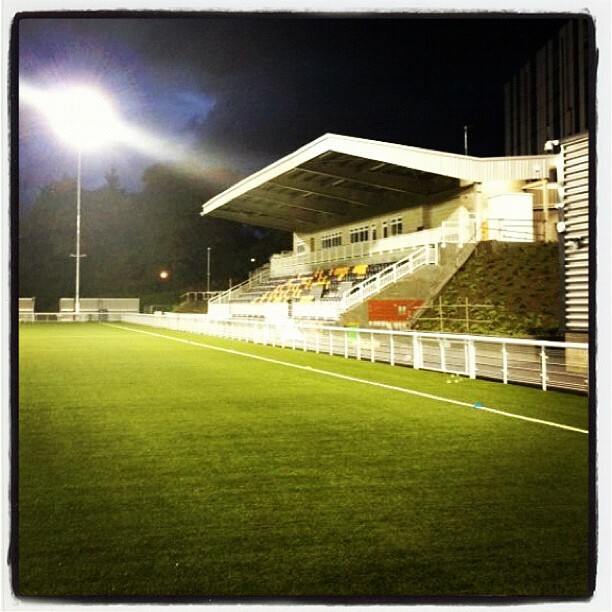 This is where Maidstone stayed as they progressed into the Isthmian League. During this period a piece of ground in James Whatman Way was destined for their own new home. Still financially struggling, work on the stadium was however infuriatingly non existent. In a cost cutting exercise Maidstone would move again as cheaper rent made Ashford Town's ground seem a more appealing prospect. In the long run dwindling attendances put paid to this idea and saw a return to Sittingbourne for the 2011-12 season. Encouraged by larger crowds and the very obvious rapid building work to the new stadium, Maidstone's performance on the pitch improved last season giving a great foundation for the side to build on as they return home for the new campaign. Brighton went to Kent and ran out five nil winners today. This was of little consequence though, the wait is over for the Stones supporters, football is back in Maidstone! Hopefully I'll be able to write a similar piece regarding Kettering Town in the future. As a little postscript to this piece, and as we're on a little good news roll, it is ten years ago this week that i went down to Gander Green Lane to watch a rather special pre season friendly. Sutton United entertained a side who were playing their first ever football match, AFC Wimbledon. Good news doesn't sell papers though so I'm guessing Rangers will still dominate tomorrows back pages.